Chennai : People for the Ethical Treatment of Animals (PETA) India has alleged that organisers of bullock cart racing had ill-treated the animals, gave them electric shocks and beat them up, during events held in Tamil Nadu earlier. 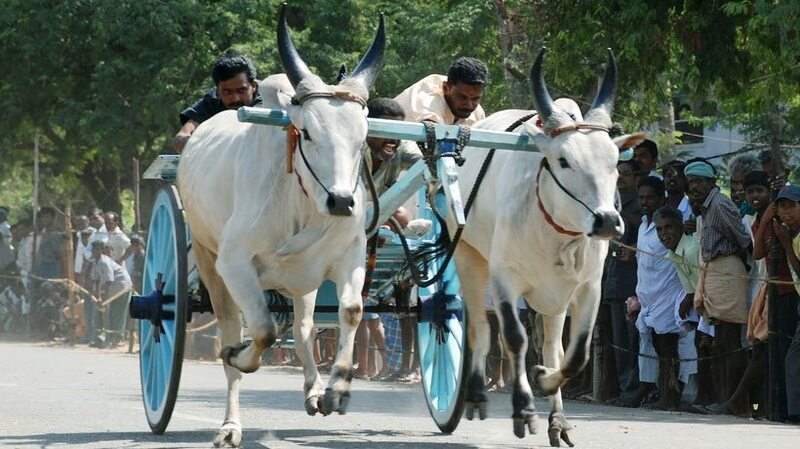 The organisers held the sports, even though the Supreme Court banned bullock cart racing in 2014 and such races are prohibited under The Prevention of Cruelty to Animals (Tamil Nadu Amendment) Act, 2017. On the basis of a Right to Information (RTI)–request response in which the Tamil Nadu government declared that rekla races and fox jallikattu are illegal in the state – as well as the latest investigation report on rekla races – the group has fired off letters to the collectors and superintendents of police of all districts in Tamil Nadu urging them to take immediate legal action against the organisers and participants of cruel and illegal rekla races. It said that at the Kolumakondan in Dindigul District on 21 January and S Kumarapalayam in Coimbatore District on 4 February, bulls were given electric shocks, roughly pulled by their nose ropes, and beaten and jabbed with nail-tipped, pointed wooden sticks and their tails being bitten and yanked to make them run faster. Bull pairs crashed to the ground and into barricades during the races, and the animals were denied basic necessities, including food, water, and protection from the sweltering heat, the animal welfare organisation alleged in a press statement here. Through a RTI-request response, the government of Tamil Nadu made clear that the Tamil Nadu Prevention of Cruelty to Animals (Conduct of Jallikattu) Rules, 2017, framed under The Prevention of Cruelty to Animals (Tamil Nadu Amendment) Act, 2017, prohibits rekla races in the state. However, illegal races are openly organised there, including a recent one held on 14 May in Panchalankurichi village in Thoothukudi District, which was flagged off by a deputy superintendent of police. The government’s response to the RTI request also stated that fox jallikattu – an event that’s rampant in the state during Pongal and for which foxes (a protected species under the Wildlife [Protection] Act, 1972) are illegally captured from the wild, their hind legs are tied together, and the animals are chased through a village – isn’t a part of Tamil Nadu’s culture and tradition. “Despite a clear court ruling and the Tamil Nadu government’s clarification that bullock races are illegal, racers in Tamil Nadu are electrically shocking bullocks, biting their sensitive tails, and beating them mercilessly in order to force them to run at high speeds on hot tar roads,” said PETA India Public Policy Lead Nikunj Sharma. “PETA India is calling on authorities to ban all cruel events involving bulls as well as all forms of jallikattu,” he said in an attempt to rekindle the controversy that had entire Tamil Nadu up in protests after the government upheld bans and prevented the sport till the government found a way out through an ordinance and facilitated the conduct of the traditional bull taming sport.